Beetroot is popular in Russian and Eastern European cuisine, but it acquires totally new flavours cooked in Indian style. 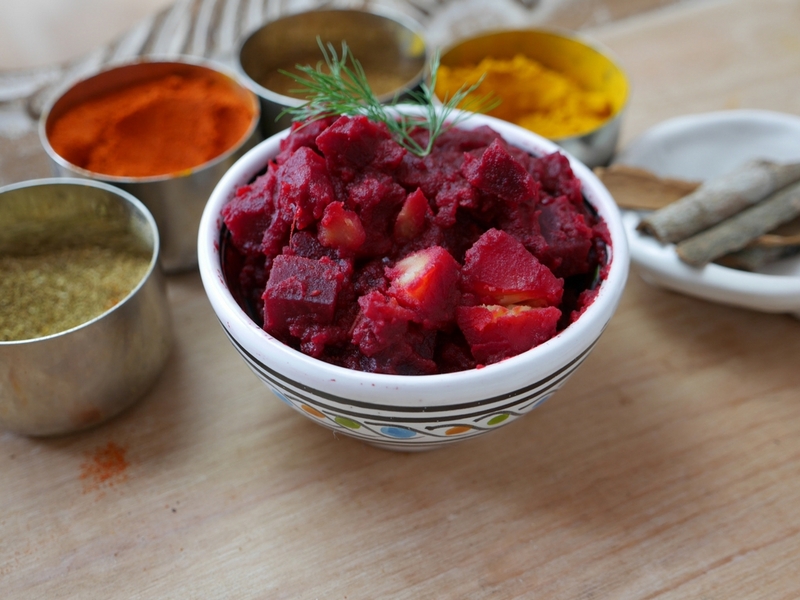 Try our beetroot curry, a great healthy recipe to make your daily plant-based menu more interesting! We pair beets with some delicate sweet spices, that bring out its flavour without giving unnecessary hotness to a dish. If you want you can add other vegetables, like carrots, aubergine or green peas. Step 1. Peel beetroots and potatoes. Chop the beetroots in small cubes (we advice you to put on the gloves while doing it), cut the potatoes in medium size pieces. Put them into a bowl and soak in water fore some time, this will take away the bitterness from the beetroot. Step 2. Meanwhile, prepare the base for your curry – ginger, garlic and onion paste. Take equal quantities of ginger and garlic, peel them, add one peeled and chopped onion and 2-3 tsp of water, than process the ingredients in a blender or food processor. Chop the tomatoes aside. Step 3. Put some ghee or another cooking oil in a pan. Add about a thumb-size piece of cinnamon. When the oil becomes warm and you feel that it smells like cinnamon, add your ginger, garlic and onion paste. Cook it for about 3-4 minutes. Stir it well to be sure that it doesn’t stick to the pan. Step 4. Now it’s time to add basic curry spices: ½ tsp of chilli powder, ½ tsp of tumeric, 1 tsp of cumin powder and 2 tsp of coriander powder. Mix it well, allow the aroma of spices to come out. Add the tomato, mix it with the spices and cook it until it becomes pulpy. If it starts to stick, you can add a tiny amount of water. Add some salt, mix it well. Now your secret curry base is ready! Step 5. Add the beetroots and the potatoes to the pan. Mix it well, add about ½ glass of water, cover the pan with a lid and keep cooking in a medium heat for about 20 minutes, mixing it from time to time. If your curry seems dry, add a little bit of water. Keep cooking until the beetroot becomes soft. Your beetroot curry is ready! Enjoy the unique mix of flavours!